"Dying is Easy, Comedy is Hard"
There is a cave in the northern Italian Alps upon which an artistic depiction of a historical event is etched into the living rock. The cave painting shows a humanoid figure holding a bone axe, directly above the figure is a ball of fire or a depiction of the sun. Off to the left side of the central figure are three more humanoid stick figures, which appear to be fleeing from the central figure. Off to the right side of the central figure are two more humanoid figures, a thin figure and a shorter rounder figure. These figures seem to be curious about the central figure yet also seem ready to flee from the scene. This cave painting appears to be the first depiction of six immortal men whose immortality stemmed from this incident. Although some people may believe that there are too many immortals in the WNU, consider that even a million immortals would really be a drop in the bucket compared to a human population measuring in the billions that has been going strong since way before 430,000 BC. Who knows how many people were killed during the great cataclysms that wracked the ancient world? The central figure has been known as a savage, a bloodthirsty conqueror, and a killer of his brother men. Various names have been attributed to him, Vadar Ang, Tubal-Cain and Kane among them. (1) Portions of his life have been depicted in various written works but on the whole he is rather peripheral to the story at hand. The other five men are the focus of this section of the article, the two curious bystanders more so than the fleeing three men. You may be able to identify these men when I say that the three men from the other tribe were all rather short. One had a shaven head due to a ritual whose origins are lost in time, another was balding but with large tufts of hair on either side of his head, the last had a haircut that would one day be called the bowl haircut, also probably some ritualized style. Of course this information comes from other sources and cannot be seen from the cave painting. The two particular cavemen who are the subject of this section were ne'er-do-well's, probably low on the pecking order of their tribes and fairly inept at tool making or hunting. If it had not been for the falling meteorite that imbued them with immortality, they probably would have lived short violent lives. As Immortals they probably carried out this pattern of their lives. It seems that Immortals in most cases, except for some episodes of the Highlander television series, portrayed as wealthy and sophisticated when in fact unless you are very skilled at maintaining continual financing throughout the ages you have about the same chance as being wealthy and powerful as any other human being. There is also the additional factor what you must be adept at changing identities and still keep your finances intact because you will need to move constantly. Even playing at being your own descendent only works for a certain length of time and only in secluded areas where there is not constant contact with the same populace who would recognize the deception. The Neolithic subjects of our article are of average intelligence, although their wide variety of experience in many professions have given them a far ranging background knowledge which serves them well when they pretend to be professionals. These immortals lived through the ages purposely never achieving great fame and kept on the move constantly holding one odd job after another. They did achieve some notoriety, although unnoticed notoriety when anecdotal stories about their lives were disseminated to the film studios and sold as film, television and cartoon plots. Actors that bores some resemblance them played their life stories in a series of seemingly unconnected films. As stated they maintained deliberate low profiles because for several reasons. The first was that as their contemporaries in their tribe aged and they remained young, and as it became known that no injury remained permanent, they became worshipped as gods. Flattered they let this attention go their heads and made exaggerated claims about their powers and they made extravagant promises that they believed they could fulfill. They led a raid against a neighboring tribe. Defeated in battle, they watched as their tribe was wiped out to the last man. Captured by the rival tribe they were sacrificed by having a horn thrust into their hearts. When they were not killed this tribe instead of worshipping them as gods kept them captives and used them as monthly sacrifices, sparing their own tribal members. The two immortals eventually escaped when disease wiped out their captives. Over a decade had passed by the time they had returned to their own tribal grounds and they were remembered not as gods but as demons who had led the men of the tribe off to be slaughtered. They were driven away from their tribal grounds. They vowed not to reveal their immortality again. Yet they did not always successfully hide their gift. Despite living into the modern age and acclimating to the changes that have taken place, they remained in many ways the simple somewhat primitive men they had been, despite acquiring some knowledge of modern science and medicines, they at heart remained superstitious, often fearful and inept at using technology. Their instinct for self-preservation ran strong and they reacted with a primal flight response rather than the violent fight response. Between themselves however they could act somewhat brutally, hitting, slapping and otherwise striking each other. The reasons for this behavior is in part derived from the primitive social hierarchy into which they were raised and to which they adhered to between themselves. Also being immortal, the injuries that they inflicted upon each other were healed almost instantaneously. Despite this however the early stint of continuous torture instilled in them a deep fear of being harmed by anyone else, so despite being for all intents and purposes unable to be killed they feared injury and death. It is important I think to understand that the various films and the various artists who portrayed Buzsla and Ollu should not be taken too literally. The films are fictionalized portraits of real events as the novel The Three Musketeers is a fictionalized portrait of real events in the life of Athos and company, the story became even further from its true origin when it was portrayed by the comedic team of the Ritz brothers. We can only glean glimpses of the truth; shadow pictures of their long lives and place them in a historical setting. Admittedly much of the timeline is guesswork but hopefully it is somewhat close to the true pattern of their lives. It should be remembered that we do not know the real names of the two men we are profiling. I created the names merely as reference points, cobbled together based on the names of the actors which portrayed them most often. Nor do we know the real character or personalities of these men, although we have a strong sense that they are well meaning but disaster prone everymen. Sifting through the canon of the pairs of the actors who most frequently portrayed the two men was a daunting task. I had to examine each film to determine which seemed to be inspired by the anecdotal history of Buzsla and Ollu and which were not. Mistakes were certainly made, some of the films that I excluded are probably part of the pair's historical canon and some of those I included are probably entirely fictional. Some may look at Stan Laurel and Bud Abbott or Oliver Hardy and Lou Costello with a critical eye and declaim that they could not possibly be the same people, they don't even look alike or act the same. I will gently remind such persons that naturally Bud Abbott and Stan Laurel are not the same person, but their comic personas are based on the same historical personage but whom their own unique comedic styles have created the illusion of a great difference. Think of Robin Hood as played by Errol Flynn, then as by played by George Segal or John Cleese. 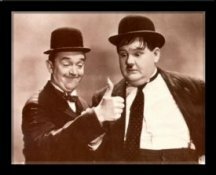 The canon for the Laurel and Hardy films was the more difficult to investigate since they played the same characters in just about every piece. You will note that I have excluded, for now at least, some of the more classic Laurel and Hardy Films such as Block Heads, Dancing Masters and many of their domestic comedies, these seem to be contemporary comedies using the same characters as most of their films but seem to have little to do with the lives of Buzsla and Ollu. Most of the Abbott and Costello canon has been included because Buzsla and Ollu seemed to have more input on the story lines of these performers' films. They were also involved in their subsequent television and cartoon series which is why these were also included. Unfortunately I do not have access to Mutt and Jeff comic strips so I cannot go into detail about their historicity. Why do we know what little we know? I know the question has been in the back of your minds as to how we know about these immortals and how the films I have included were influenced by their lives. In the early 1900's Buzsla and Ollu were horse racing enthusiasts while living in San Francisco just prior to the great Earthquake. They used the names Augustus Matthew and Wilber Jefferson. They met a young sports cartoonist named Bud Fisher. In the course of general conversations they revealed to him past experiences which were humorous. Although they were of course careful to use only contemporary references when telling him of their experiences, although they did often slip up on the locations in which the events took place making it seem as though they were well traveled, more so than believable. Buzsla claimed to have met Ollu in an insane asylum and Ollu claimed that Buzsla was the stupidest man in the history of the world. Buzsla and Ollu were at that time married to a pair of sisters who were becoming quite suspicious of their husbands activities, which did not appear to be of maintaining gainful employment. They were also suspicious because in the years they had known their husbands the men had not seemed to age a day. Ollu and Buzsla used the San Francisco Earthquake to escape from the lives and identities in which they had become entrenched. Bud Fisher created the first comic strip entitled A. Mutt based at first on Buzsla and then he added Ollu as a character calling them Mutt and Jeff. (4) He gave them shrewish wives and made Mutt to be incredibly stupid and Jeff to be insane. Ollu and Buzsla read the strip for years without knowing it was based on them until the forties when Bud Fisher accidentally ran into them once more. Fisher had quit writing the Mutt and Jeff comic strip in the mid-nineteen-thirties and Fisher lived the life of a wealthy idler— luxury cars, luxury homes, luxury cruises. It was on a cruise that Fisher ran into Ollu and Buzsla and told them he had based his strip on them. They were not amused and avoided him the rest of the cruise. When Fisher sobered up he realized that they were exactly the same age as they had been when he had known them before. He began to believe that he had only imagined the encounter, then began to think that his cartoon characters had come to life. Although it cannot be proven, this incident may have lead to Fisher's become a virtual recluse in his old age. In 1922, Buzsla and Ollu were working in silent pictures as stuntmen, despite their general ineptitude they were both pretty good athletes and they could take a great deal of damage and not be permanently injured. After one of their many fallings out, Ollu went on a bit of a bender. While drunk he spouted off his entire life to a couple of scenario/gag writers between positions. The writers of course did not believe his wild tales of being thousands of years old but found his stories incredibly humorous. Ollu's version of events tended to make his thin companion out to be a brainless clod. The gag writers worked for Mack Sennett and Hal Roach studios. Their first scenario was used in the silent short Duck Soup, Pathe 1927, which featured Mr. Laurel and Mr. Hardy in an early form of their characterizations of Buzsla and Ollu. Although this film is not considered by many purists or even by the team of Laurel and Hardy to be one of their team's canonical films, it does seem to represent part of an episode out of the lives of Buzsla and Ollu. The team of Laurel and Hardy went back and forth in 1927, 1928 and 1929 between using their characterizations for Buzsla and Ollu and discarding them. Part of this may have been due to a lack of material, when Buzsla discovered that his partner had "sold" their story and made Buzsla out to be a near moron he was furious. To smooth things over, Ollu visited the gag writers and told them not to use anymore of his ideas without compensation and to pay him for what they had used. To make his point Ollu may have reverted to his early primitive days. Unwilling to admit to the studio head's that they had borrowed material, the gag writers scrapped enough cash to pay Ollu. After taking the money Ollu spouted off more of his fantastic anecdotal history. The writers used more of the material he had given them since he did not seem to be around. When Ollu did not return to protest, they used a bit more of the material that he had given them. One of the two gag writers, a long time friend of Jack Pickford and Wallace Reid died from a drug overdose. There was some suspicion that his fellow writer was also his supplier, he sold the written story ideas to Stan Laurel for some quick cash. Using some of this material as a base, Laurel and Hardy based the story lines of some of their comedic shorts on this written material. Although Buzsla was angry that Ollu had not stopped the slanted history of their lives from being used in film work he was like many people thrilled to see himself, or at least a representation of himself on screen. In the early thirties Buzsla and Ollu worked off and on in vaudeville doing a variety of acts. Over the ages they had acquired knowledge of differing types of entertainment and their ability to take punishment without harm made their slapstick routines very realistic. While on the Vaudeville circuit Buzsla became acquainted with a writer named John Grant who was also the acquaintance of a pair of Mutt and Jeff pair of comedians named Abbott and Costello. Abbott and Costello were making a name for themselves for refurbishing old vaudeville routines with a dash of slapstick, although their material may not have been original their delivery and characterizations were unique. Seeing a chance to get back at his pal, Buzsla told Grant some anecdotal history, delivering it as the basis for skits that the comedy troupe might be interested in. He made certain that the shorter, stocky guy was portrayed as the dope. In 1937, Abbott and Costello started working on the Kate Smith Radio show, coincidentally Ollu and Buzsla were also working in radio or at least on the fringes of it, working as soda jerks attempting to become radio play writers. They renewed their acquaintance with John Grant and began tried out several of their story ideas on him. These story ideas were for the most part based on historical incidents in Ollu and Buzsla's life. Believing that the ideas at least had merit, and that the boys were down on their luck, Grant purchased several of their scenarios. Grant would later utilized many of these ideas when he wrote films for Abbott and Costello. Since Buzsla would keep in contact with him over the years, Ollu and Buzsla had some influence on the story lines of the films that Grant wrote, although the writing was all Grant's work. Because their stories had become so identified with the characters played by Abbott and Costello, Ollu and Buzsla could get a vicarious thrill knowing that they could have their stories told even if it were in a fantastic manner. This did not bother them as much it might have modern men since they were used to history becoming fantastic tales or myth. In 1951, Abbott and Costello were beginning production on what was to be their foray into television. Ollu and Buzsla had some input as to the content of the shows through their connection with John Grant. They provided him with story ideas and even talked their way into being hired as unaccredited writers for the television show. This relationship also led to the revelation of their extraterrestrial adventure. The television show will be discussed in more detail in the chronology. After the film Abbott and Costello Go to Mars was released, Ollu and Buzsla feared exposure again and kept a low profile. They did surface briefly in the 1960's as writers for Hanna-Barbera cartoons. 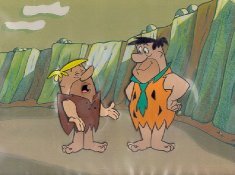 Although the cartoon series, The Flintstones had many creative influences including the then current situation comedy The Honeymooners, there are actually many inconsistencies about its origins. Many people claim to have had the original concept for the show. Ollu and Buzsla encouraged this confusion surrounding the original idea for the show so that it would not lead back to them. They used their experiences in the ersatz twentieth century civilization set in Neolithic age to form the basic concept for the show of a modern Stone Age family. The domestic comedy was borrowed somewhat from The Honeymooners Ollu and Buzsla were convinced that once again someone had built a series based on their lives, again without permission. Despite the girth of Ralph Cramden and the thin nature of Ed Norton there is little to suggest that these characters were based on Ollu and Buzsla. They may have been reading too much into a coincidence, despite having known a young comedian named Jackie Gleason in the late forties in New York. They did manage to insert into the story line an inside joke in having the character of Bam Bam introduced into the series. Bam Bam was however written as an adopted child rather than the actual descendent of Buzsla. Ollu and Buzsla were still working for Hanna-Barbera when they became involved in a few cartoon series based on some aspects of their long lives. Among these were the adventures of Laurel and Hardy and of Abbott and Costello. Ollu and Buzsla slipped more of their long history into this cartoon, often touching upon epochs that they did not dare to bring up in the various films based on historical incidents in their lives. They felt that the cartoon medium would cause the factual material embedded into the cartoon story lines to also be dismissed as fictional. The historical episodes were interspersed with fantasy and science fictional episodes so the general consensus would be that the entire cartoon series was a complete fabrication. The whereabouts of Ollu and Buzsla after 1966 are hard to discover they had become adept at hiding their identities. The group known as the Watchers know about them, the three stooges and probably Vandar Ang and keep loose watch on them but because they are not Highlander type immortals do not consider them part of their project. However those records are not for public consumption, although leaks have certainly surfaced. Although the evidence is uncertain they have been in Florida and became involved with another Mummy. Oddly enough, some that have tracked these immortals through the ages have claimed that the hit show Seinfeld was based in part on the lives of Ollu and Buzsla as they lived in New York in the seventies and eighties. Jerry Seinfeld has stated that the Abbott and Costello Television show influenced his comedy. Writer/Producer Larry David has proclaimed that the show's characters and situations were based on people he knew in New York and upon his life as a New Yorker. I will take him at his word. However playing devil's advocate for a moment, the careful observer of the Seinfeld show will notice that there are actually two sets of Mutt and Jeff type characters in the show; Jerry Seinfeld and George Costanza for one, and Cosmo Kramer and Newman. Jerry and George seem to represent the intellectual side of the Mutt and Jeff pair, most of their comedy comes from verbal banter or social situations, Kramer and Newman however seem to become involved in more of the slapstick antics and so could be said to represent the physical side of the Mutt and Jeff pair. It is also interesting to note that Newman's first name is never revealed and it took five years to reveal that Kramer's first name was Cosmo. It as if they were never intended to be fully realized persons but rather aspects of the other pair. Again I believe Mr. David when he states that Kramer and Newman were based on real people and I just throw that out for the sake of speculation. As to how I know information beyond what I am supposed to know. Much of the information is speculative but some of it is based on material I acquired through three auctions. One auction consisted of the papers of a minor scenario writer during the early days of motion pictures. Much of his work had been written while in the throes of drug addiction. This writer's papers had already passed through several hands but in them I found scenarios based on Ollu's yarns to this writer. These copies included short, semi-literate annotations, possibly written by Ollu or Buzsla. The second auction consisted of material from an employee of Hanna-Barbara. His family had gathered up whatever was in his file cabinet and put it on line for some quick cash. Among the various minutia was some background story ideas for various cartoon series that never made it to the drawing board or which had been drastically changed when they were made. A few examples of the drastically altered shows were the Flintstones, Migh-Tor, Dino Boy and Captain Caveman. Also among this material were copies of the planned episodes of the Abbott and Costello cartoon. These script treatments had with some annotations written in the margin. The handwriting of this marginalia was very similar to that on the notations written on the papers I have received from silent era writer from Hollywood. I saw a connection. The final piece of information that tied much of material from silent era writer and the cartoon writer and correlated it was an online auction for discarded mail from the Highlander television show. Among this material were rejected story ideas and script treatments. There were several scripts ostensibly by three different writers yet whose characters had nearly identical names. The characters were also invariably a tall thin man and shorter, stout man. Many of these script treatments and story ideas were very similar to some of those I noted earlier in the two shipments of papers I had received a couple of years earlier. This time however the characters were definitely Immortals but not Highlander type Immortals which may be one of the reasons that their ideas had been rejected. 2. These bloodthirsty Immortals who went about chopping each other heads off are of course the Highlander type Immortals whose decapitation releases the accumulated memories, experiences and sensations of the immortal in a burst of electromagnetic energy. The name from this type of Immortal is derived from two famous Immortals, Duncan and Connor MacLeod. Two others who seemed to be descended from both Buzsla and Ollu were two men born in differing decades who became alternately fast friends and rivals. They were together often but also had separate adventures. Their exploits will be detailed in an appendix. 4. Mutt and Jeff were comic-strip characters from the early 20th century. A precursor to Laurel and Hardy, they were two working-class everymen -- drinking, gambling, and getting in hot water with their wives. In 1907, a San Francisco Chronicle cartoonist named Bud Fisher began drawing a daily comic strip called "Mr. Mutt." A short time later, he added the diminutive Mr. Jeff, and "Mutt and Jeff" was born. Mutt was a tall, lanky man with a penchant for the ponies, while Jeff looked like the Monopoly man after a rough weekend. Mutt and Jeff were affable losers -- the guys in the cheap seats at horse races on a Wednesday afternoon. The boys started out as an amusing side strip in the Chronicle sports pages, but by 1915 Mutt and Jeff were a national phenomenon. Fisher launched himself full-throttle into a life of fame and fortune (he once owned 50 thoroughbreds), but he quit drawing the strip. He "supervised" a woefully underappreciated team of illustrators and writers until his death in 1954. Many people consider "Mutt and Jeff" to be the first daily comic strip. While this is open to debate, they were certainly quite popular in their day, even scoring a lucrative cereal sponsorship at the height of their fame. Ashley, Chip The Dino-Boy FAQ. Cervantes, Miguel de "La Gitanella". Island of Lost Souls, Universal Pictures, 1933. Lai RickThe chronology of Shadows.